First, let's be clear - it is not as simple as seeing how far you can ride in a one-hour period of time. There are lots of rules that guide this coveted record. There are also three types of hour records: Absolute (Best Human Effort), Classic (no aero equipment), and Unified. All the recent talk is about the Unified Hour Record and the new rule changes made in 2014 by the UCI. Since cycling's governing body, the UCI, announced the changes allowing for modern equipment, four men have officially lined up to attempt the record, three have been successful in beating the previous man's time. Behind these men, picture the bike manufacturers wanting to show off their best engineered aero track bikes. After laying nearly dormant, chasing the hour record has become a big deal. In 2013, before the rules were officially changed, American Colby Pearce set a Unified record in Colorado Springs, at altitude, with a distance of 30.948 miles. His achievement has not been retroactively recognized. On September 18, 2014, retiring German road cyclist Jens Voigt lined up to give the record a well-publicized try. He put his name first on the books after the rule change, with a distance of 31.758 miles, and retired with great fanfare. Next to line up was Austria's Matthias Brändle of IAM Cycling, he also rode at sea-level but at a different shorter velodrome in Aigle, Switzerland. He beat Jens Voigt's distance by less than a mile, with a distance of 32.219 miles on October 30, 2014. Australian Jack Bobridge, unsigned by a pro team for the year, decided to devote himself to putting his name on the books with an attempt that fell short of Brändle's, with a distance of 31.876 miles on a track in Melbourne. He pedaled a distance that would have beaten Jen Voigt's record, but did not top Brändle's. Next to the line was another Aussie, Rohan Dennis, of Team BMC. Deciding to ride on the same track that Jens Voigt used in Grenchen, Switerland, he succeeded on February 8, 2015, with a distance of 32.616 miles, setting the Australian Hour Record at the same time. Update: On February 26, 2015, Dutch cyclist Thomas Dekker attempted and failed to beat the hour record in Mexico with a final distance of 32.448 miles in one hour. The gap to Rohan Dennis' current record was a mere 17 seconds. Again Dekker would have beat the distances of Jens Voigt and Matthias Brändle, but these two men were lucky to get their names on the book early. The distance to beat was 30.882 miles, set by Ondrej Sosenka, in Moscow in 2005. Jens Voigt - 31.758 miles, in Grenchen, Switzerland, on a Trek bike, 2014. Matthias Brändle - 32.219 miles, in Aigle, Switzerland, on a Scott bike, 2014. Rohan Dennis - 32.616 miles, in Grenchen, Switzerland, on a BMC bike, 2015. We will see more future attempts at the record. When the rules changed, all eyes stayed on the amazing time trial abilities of Fabian Cancellara, but he claims to have now lost interest due to the UCI changes in equipment regulations. Cancellara was interested in breaking the old record, when it was more about the man than the machine. Decorated track Olympian, Bradley Wiggins, is said to be planning for the hour record in June 2015. Once he hits the track, few will have the nerve to challenge the man many believe will set a leading distance that will stand for some time. Other rider names in the news with big dreams include Alex Dowsett, Alex Rasmussen, and time trial World Champion Tony Martin. Although Tony Martin is a remarkable time trialist, Bradley Wiggins combines time trialing ability with impressive track know-how and proven results. If anyone wants their name on the book, they better beat Wiggins to the track before June 2015. With the One-Day Classics about to start, followed by road racing obligations to teams, personal hour records and the resulting bike brand promotions might be delayed, until it is too late for most. I would like to see an attempt by both Tony Martin and Bradley Wiggins. 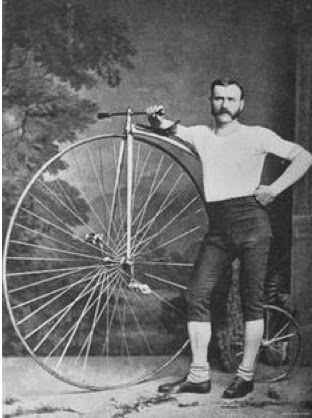 A 49" high wheel bicycle. The bike looks old, but the guy looks like the same one who works at my local bike shop. Some things never change.